If you're not reading 'Tomboy' by Mia Goodwin and Michelle Wong you're missing out on one of the best comics being published right now. Goodwin takes the magical girl genre and incorporates a police procedural, a corporate conspiracy, and horror fantasy. It's a tall task to manage but Goodwin does so with perfect execution in a tale that is twisted and shocking. 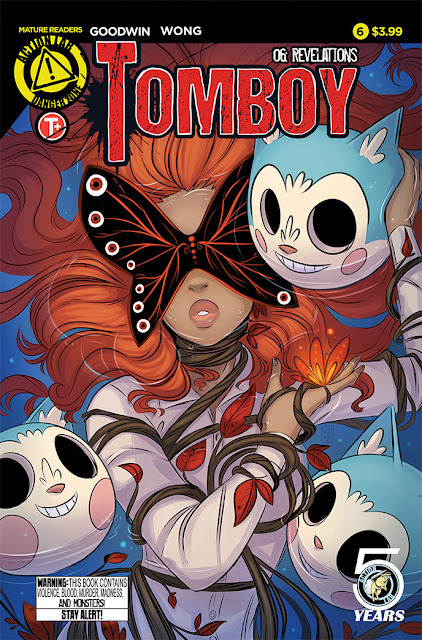 Issue six is a great example of just how good 'Tomboy' is. While Warren comes across some damning evidence against Irene Trent, his daughter Jessica is held hostage unbeknownst to him mistakenly identified as the killer of Trent's minions. The dirty cop in the middle of it all is Detective Tico. Goodwin details some of his backstory leading up to this issue and the line between good and evil is blurred, proving the road to hell is indeed paved with good intentions. Tico is forced to do some horrible things but you can't help feel a little empathy for him. Addison takes a backseat in this issue for the most part until the explosive third act. We learn more about the origins of her powers and the scale of what Trent is up to. Throughout, Goodwin ratchets up the tension, injecting some terrifying visuals, and challenging our sense of justice. We get some clues in the ongoing mystery and a shocking ending. 'Tomboy' continually delivers from a narrative standpoint, as a thriller and brilliantly illustrated. Goodwin provides dynamic layouts while Michelle Wong does the crisp clear line work and muted colors. Wong's character designs and varied perspectives lend to the tension and mystery of certain scenes. One sequence in particular, takes a sparse nuanced approach before a surprising use of bold color totally changes the tone of the scene. You could not choreograph a better issue from start to finish than this one. The quality of 'Tomboy' is not in doubt. It's one of the best comics, horror, fantasy, or otherwise. This book deserves more readers, more eyeballs taking in this masterfully conceived story. Goodwin has all the makings of joining the ranks of Gail Simone, Kelly Sue DeConnick, and Ed Brubaker. Get a copy or two, tell a friend, tweet about it, whatever you have to do to get 'Tomboy' in more hands.